Over the last three years, we’ve mentioned many Chinese made pencils – yet these have always been pencils made in China for other brands and firms. This is the first Chinese pencil associated with the originating factory that we’ve seen. Thanks to blog reader Jieun for proving these pencils! 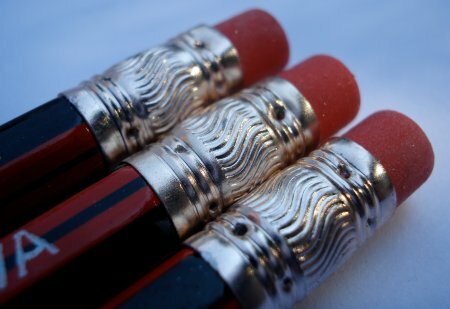 These pencils were made at the China First Pencil factory. One of the most interesting things to be seen at their website is the pencil making machinery for sale. Wow, I wonder what it would cost to start a small pencil factory in the garage? The packaging is among the nicest we’ve seen for a cardboard box of pencils. The box reminds us, “It is appraised that the paint on this pencil is up to hygenic standard and is harmless to human body.” Who would want anything less? The pencils have a fairly complicated pattern, alternating black with red-and-centered-black-stripe. One side has Chinese text (gold), and the opposite side English (silver). The ferrules display a bit of fanciness. They sharpen easily and have a nice look – yet – for such a promising pencil, the lead is unfortunately just so-so. Interesting! But Chinese pen and pencilmakers delight in too much fanciness. Good to see the review of the Chung Hwa pencil! I picked up a box (dozen) of Cheng Hwa Drawing pencils at a dollar style store here in the Pacific Northwest. The lead is buttery smooth, and I have been hoping to track down more info about the company. Thanks! victoria, you’re right! 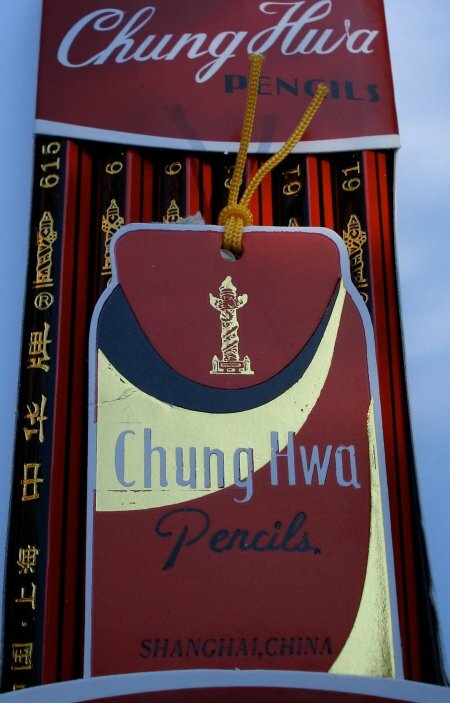 the chung hwa pencils were sold in almost every stationery store in singapore :) – probably still is. i used quite a few of them myself. I picked up two boxes of these in Hong Kong last month at a place called Japanhome. It was like a dollar store. I like them and wish I had gotten more since I never see them in the US. Chung Wah pencils are definitely a better value for school than Staedtlers. If you like pencil sketching, then a pack of Staedtlers is tops. I always rip the erasers off the tops of this type of Chung Wah pencil, since they make red marks instead of erasing. For the same ‘eraser’ effect, I prefer the Chung Wah pencils with a plain red painted top, which come in packs of twelve in a light cardboard packaging. Of the Chinese School classmates who borrowed my Chung Wah pencils, most kept them as trading items. One was worth two Pentel erasers! So where can we get these here in the States? For that matter where do you get most of your foreign pencils? Battra92 – sorry, no idea where they can be found. I am most impressed with the first picture of the pencil: such a long, perfect point! What sharpener did you use? Hmmm, unfortunately I didn’t record the sharpener used, and don’t recall now. In Hong Kong, they sell for 4 HKD (0.5 USD) per pack – just some additional info on how cheap they are really! childhood days in HK as a diligent student who is in love with paper, pen, printed matter and stationery in general! My son found one of these pencils in the snow on his college campus and brought it home for me. I feel bad for the student who lost it (I’m guessing that it might have traveled with that student to the United States), but at least the pencil has a good home. Thanks for the info on its background. I’m looking for Chung Hwa 6700 2B pencil. It has a triangular grip, good for learners. Please let me know if anyone knows where I can get it. Thanks! I have been using Chang Hwa 6051 since 1970’s. I still have boxes of HB to get through. The eraser end sux but all else is good. I just found two 12 packs of these at a thrift shop for a buck! The original price tag on the box was $4.80 per dozen. for a half decent pencil that still is pretty good. I was quite surprised at how nice a pencil this actually is. The styling is reminiscent of a Staedler tradition. True that the eraser leaves plenty to be desired,but God knows how old these pencils are. The graphite is perfectly centered in all the examples I have. This pencil is an excellent example that a high quality pencil can can come out of China. As a previous review mentioned it was buttery smooth to write with and I will add that a significant amount of pressure has to be applied to break the tip. All things considered the 6151 is a pencil worth picking up for the writer and collector alike, if you can find one. The 6151 is a well made pencil that not only functions well in use but is very nice to look at. At the end of the day it’s no BlackWing but neither is the BlackWing. How much is one dozen of this pencil?.. Previous PostPrevious Pencils in the news!